The fourth annual Island Hopper Songwriter Fest has over 80 confirmed songwriters, bringing more than 150 live performances and 24 unique venues to music fans along The Beaches of Fort Myers & Sanibel in Southwest Florida. PierSide Grill and Famous Blowfish Bar on Fort Myers Beach will serve as a venue for a series of live performances from nationally acclaimed singer-songwriters as part of the festival Sept. 29 through Oct. 1 on Fort Myers Beach. 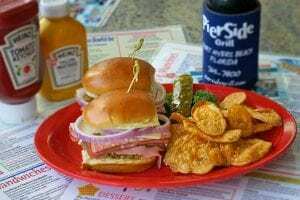 Live performances at PierSide Grill and Famous Blowfish Bar are free and open to the public, and concert-goers can enjoy LandShark 12-ounce longnecks for $2.75 throughout the weekend. Performances will begin Friday, Sept. 29, with shows by Eli Mosley, Adam Wood and Lockwood Barr at 7 p.m., John Wiggins and Steve Dean at 8:15 p.m. and Frank Myers and Julia Cole at 9:30 p.m. On Saturday, Sept. 30, performances will begin at 2:30 p.m. with Jeff Prince and Joey McGee, followed by the winner of the Song and Chance Contest and Karleen Watt at 4:15 p.m., Julia Cole and Brandon Kinney at 6 p.m., Tim James and Bill LaBounty at 7:15 p.m. and Maggie Rose and Josh Dorr at 8:30 p.m. The 2017 Island Hopper Songwriter Fest will conclude on Sunday, Oct. 1, with performances by Great American Canyon Band at 1:30 p.m. and Lance Carpenter and Julia Cole at 3 p.m.
Island Hopper Songwriter Fest is presented by Lee County Visitor & Convention Bureau, iHeartMedia, Cat Country 107.1 and BMI, the largest music rights organization in the U.S. For more information visit www.islandhopperfest.com. Follow the festival hashtag #islandhopper on Twitter and other social channels. Photos available upon request.